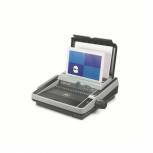 GBC CombBind C110 Comb Binding Machine 4401844 Pack of 1 Binding guide prevents mistakes. Punch alignment for consistent results. Suitable for A3 and A4 paper. Low force mechanism for easy use. Punch Capacity: 12 sheets (80gsm). Binding Capacity: Up to 195 pages using a 22mm comb. GBC CombBind C200 Comb Binding Machine 4401845 Pack of 1 Binding guide prevents mistakes. Punch alignment for consistent results. Suitable for A3 and A4 paper. Low force mechanism for easy use. Punch Capacity: 20 sheets (80gsm). Binding Capacity: Up to 330 pages using a 38mm comb. Q-Connect Premium Comb Binder 12 KF16762 Pack of 1 Q-Connect Comb Binder 12. Binding capacity up to 250 sheets. Punches up to 12 sheets. Maximum binding size 51mm. Punching margin 2-5mm. Dimensions: W350xD275xH150mm. GBC CombBind C200E Comb Binding Machine 7101045UK Pack of 1 Electric comb binding machine. Unique low force punch and sheet alignment indicators. Quickstep Work Flow Guide for simple and intuitive operation. Binds A3 portrait and A4 sizes. Punch capacity up to 15 sheets. Binding capacity up to 330 sheets. Q-Connect Professional 21 Hole Comb Binder 25 KF16763 Pack of 1 Q-Connect Comb Binder 25. Binding capacity up to 450 sheets. Punches up to 25 sheets. Maximum binding size 51mm. Punching margin 2-5mm. Dimensions: W490xD415xH165mm. 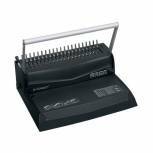 Fellowes Quasar-E Electric Comb Binding Machine 5620901 Pack of 1 Fellowes Quasar 500 Electric comb binder punches up to 20 sheets and binds up to 500 sheets. Features document thickness and comb sizing guide, built in comb storage tray and vertical sheet loading for accuracy. 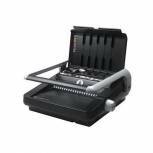 Fellowes Galaxy Manual Comb Binding Machine 5622001 Pack of 1 High capacity manual comb binder with a strong handle punches up to 25 sheets at a time. Binds up to 500 sheets of paper with a maximum comb size of 50mm. Features a document and comb size guide and adjustable paper stop. Starter kit included. 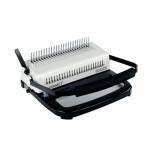 Fellowes Galaxy Electric Comb Binding Machine 5622101 Pack of 1 High capacity comb binder with Electric punch mechanism punches up to 25 sheets at a time. Binds up to 500 sheets of paper with a maximum comb size of 50mm. Features a document and comb size guide and adjustable paper stop. Starter kit included. 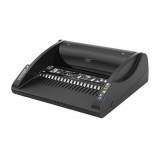 Fellowes Star A4 Manual Comb Binding Machine 5627501 Pack of 1 Fellowes Star A4 Manual Comb Binding Machine 5627501. Ideal capacity for home office use with a compact, user friendly design and operation. 10 sheet punch capacity. 150 sheet binding capacity. Vertical storage. 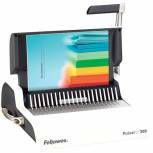 Fellowes Pulsar A4 Comb Binding Machine 5627601 Pack of 1 Fellowes Pulsar A4 Comb Binding Machine 5627601. 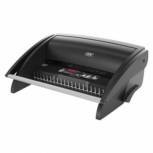 A medium sized binder, ideal for small office use, features chip tray with burst out feature to eliminate jams. Includes binding starter kit. 15 sheet punch capacity. 300 sheet binding capacity. 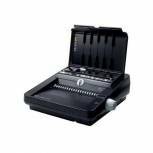 Fellowes Grey Quasar+ 500 Manual Comb Binding Machine 5627701 Pack of 1 Fellowes Quasar Manual Comb Binding Machine. Ideal for the binding requirements of medium to large offices. Allows users to punch and bind continuously. 20 sheet punch capacity. 500 sheet binding capacity. 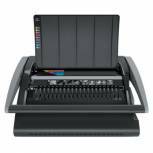 GBC CombBind C210 Comb Binding Machine 4401846 Pack of 1 Binding guide prevents mistakes. Punch alignment for consistent results. Suitable for A3 and A4 paper. Low force mechanism for easy use. Punch Capacity: 25 sheets (80gsm). Binding Capacity: Up to 450 pages using a 51mm comb. GBC CombBind C340 Comb Binding Machine 4400420 Pack of 1 GBC CombBind C340 binding machine. Comb binder with auto edge feature, auto centring, easy access clippings tray, double handle, quick starter guide and document separator. Punches up to 25 sheets and binds up to 450 sheets. 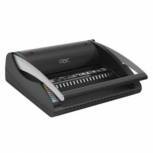 GBC CombBind C450E Comb Binding Machine 4400421 Pack of 1 GBC CombBind C450E binding machine. Comb binder with Electric punch, auto edge feature, auto centring, easy access clippings tray, clippings tray full indicator and document separator. Punches up to 25 sheets and binds up to 450 sheets. 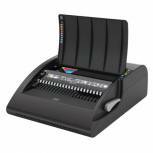 GBC MultiBind 230 Multifunctional Comb/Wire Binding Machine 4400423 Pack of 1 GBC Multibind 230 comb and wire binding machine. Punches up to 30sheets and binds up to 450 sheets (comb) and 125 sheets (wire). Features paper separation, auto centring, auto edge system, easy access clippings tray, double handle and comb selector. 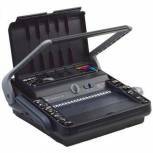 GBC MultiBind 230E Multifunctional Comb/Wire Binding Machine 4400424 Pack of 1 GBC Multibind 230e Electric comb and wire binding machine. Punches up to 30sheets and binds up to 450 sheets (comb) and 125 sheets (wire). Features paper separation, auto centring, auto edge, easy access clippings tray, double handle and comb selector. GBC MultiBind 320 Multifunctional Comb/Wire Binding Machine IB271076 Pack of 1 GBC Multibind 320 comb, wire and 4 hole binding system. Punches up to 30 sheets, comb binds up to 450 sheets and wire binds up to 125 sheets. Features paper size guide, comb/wire size guide, margin depth selector and 7 de-selector pins. 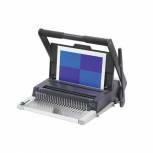 GBC CombBind C210E Comb Binding Machine 4401927UK Pack of 1 Acco GBC CombBind C210E Comb Binder 4401927UK. Ideal for offices with frequent binding requirements.